Driving around Dominica with Lennox Honychurch can be a little disconcerting. If he’s driving, he stops every few minutes to give someone a lift – and will spend some time asking them familiarly about their job, family, and their situation generally. The fed-up-looking Rastafarian man going to the Chinese construction company to get a job. The smart young woman on her way to the restaurant where she works as a hostess. The tradesman he needs to do a job at his house. If he is in the passenger seat, at every intersection and stoplight, several people will call him by name. 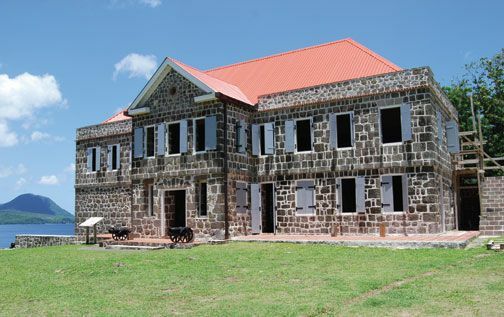 Even in a small island where everybody knows everyone else, this is unusual; but Honychurch’s position in Dominica is unique. 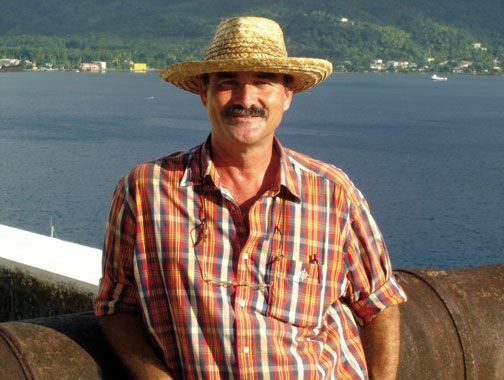 He has been described by the President of Dominica, Nicholas Liverpool, as “the icon” of the island, “an indispensable part of our history and culture” – the go-to man for anything to do with the island. 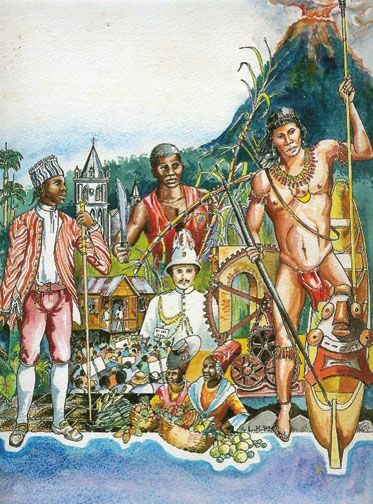 He is a human archive, and knows everything about Dominica from discovery to the present. He is the country’s scribe, apologist, legislator, and artist. He has participated in the island’s political evolution, as a member of its house of assembly, and on the team that negotiated for independence from Britain in 1977. 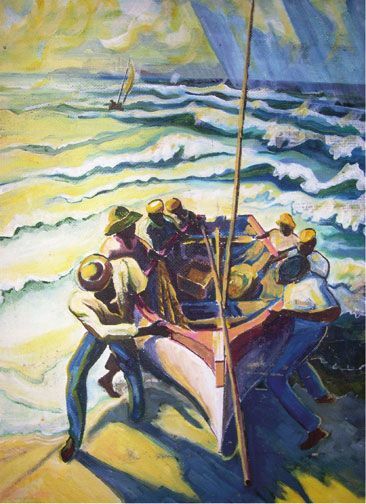 His murals adorn churches through the island, the main post office in Roseau, and the national museum. 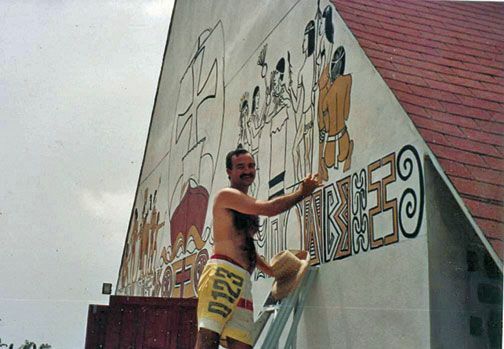 He is a restorer of its built heritage, champion of its First Peoples and a Carnival artist. 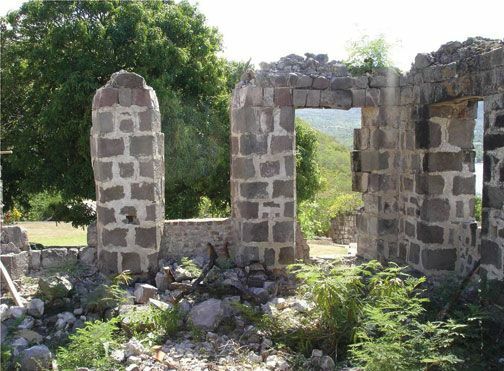 There is no place in the island, from the sanctum of the Soufriere Church, to the visitors’ centre of the Kalinago Territory, where his presence is not felt. But talking to Honychurch, you would hardly know this. In person, he is informal, affable, and loquacious. 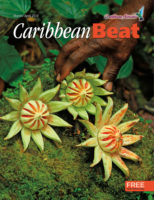 His home, in the southern, wild part of Dominica, is set on a small, grassy cliff and looks out over an aquamarine bay. 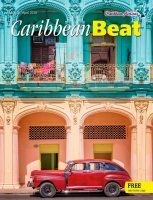 Sitting there, book in hand on the low verandah, he sighs at the heavy iron doors that secure the house – a sign of the times everywhere in the Caribbean today. In 2011, there are more Dominicans abroad than in the island, and the narrow ribbon of pitched roads that encircle the island’s mountainous centre are refurbished and extended by Chinese crews, courtesy of the Chinese government. And, as a consequence, the inevitable small Chinese-operated restaurants and groceries are beginning to appear. 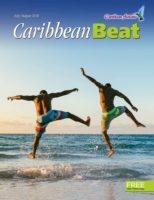 This is a reality of the post-millennial Caribbean – a flux of peoples, positions and economic realities – that Honychurch understands. 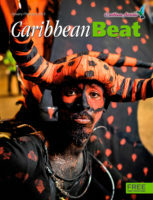 His family has been in the Caribbean since the eighteenth century, and remains spread throughout. This has imparted to him a sense of belonging and continuity which is at once inspiring and bemusing in the age of northward metropolitan migration. “When I was young my parents took me all round the island, and showed me, well, everything. 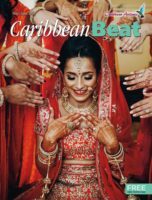 They taught me that everything was important, and had its place, and everyone had a responsibility to their community.” He went to school in Barbados and he had a grandmother, aunts and uncles who were born in Trinidad, where he has been a regular visitor since childhood. The radio experiment led him down two paths: one into electoral politics, and the other into academia. He was approached by Eugenia Charles (who would become prime minister in the 1980s) in 1975 to enter politics. He was a member of Dominica’s House of Assembly from 1975 – 1979 – the youngest parliamentarian in the island’s and region’s history, at 22. When Charles became prime minister, he served as her press secretary for two years (1980 – 81) until politics became oppressive and he departed. But the other path, as an historian and educator, was more promising. 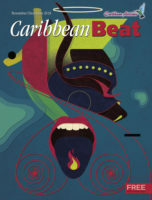 After the radio broadcasts, he was encouraged to write a book, The Dominica Story, and later, a series of textbooks, The Caribbean People, which have been standard texts in secondary schools throughout the region since their publication in 1979. 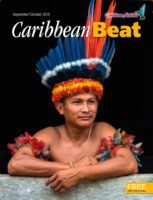 He has since published another six books on Dominican and Caribbean history, and several academic and journalistic articles. He also organised the first international conference on the Dominican writer Jean Rhys in 2004, in the island of her birth. The radio programmes also alerted him to the possibilities of a different approach to education. They showed him that “you cannot use the more traditional methods of education to help a country understand itself, if you want to do it on a wide scale. You want public awareness and public involvement in their heritage.” This is achieved by bringing that heritage to life through restoring its historic architecture, protecting its vulnerable ecology, and understanding how its people came to be where and who they are. All this was done without a university education. He was advised that he would be an undergraduate among students who had used textbooks he had written, so perhaps his time could be more profitably spent continuing his work, and holding off on the degree a while. Subsequently, on the basis of the work he had done, he was awarded a Chevening Fellowship to Oxford, where he read for his MPhil and PhD in anthropology and museology (1995). His theses were on the Kalinago First Peoples in Dominica. This is a topic only now gaining in recognition as one of importance, but it has always been a priority for Honychurch. The Kalinago community in Dominica numbers just under 4,000, and they live on a reserve in the middle of the island. The Kalinago Chief, Garnette Joseph, acknowledges Honychurch’s role in telling the history, and also in looking after the interests of the community. He was instrumental in setting up a visitors’ centre, and the development of income-generating activities, such as handicrafts and nature tourism, which sustain the community. Sustainable tourism, and other forms of sustainable economic activity, have recently become developmental buzzwords, but they have always been part of Honychurch’s idea of development. 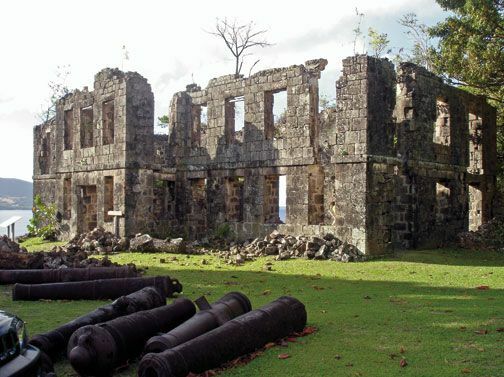 In the Cabrits National Park in Dominica were, 20 years ago, the ruins of a fort (Fort Shirley) from the colonial era, which was being encroached on by the jungle. Honychurch single-handedly started its restoration. The funds came in later, and today, Fort Shirley is a beautifully restored centrepiece of the park, which is used as a tourist attraction and conference centre. 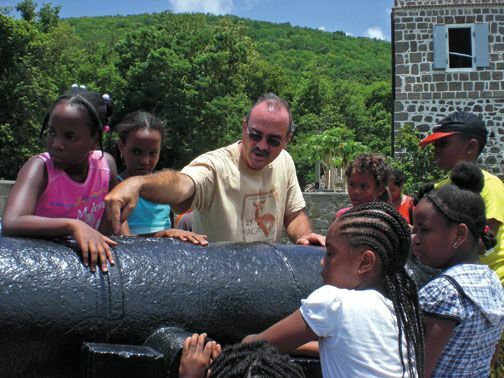 He was also instrumental in setting up Dominica’s national museum in Roseau and has participated as a consultant, or part of a team, at other museums and heritage sites throughout the Caribbean, including the Betty’s Hope Plantation in Antigua, Ft Frederick in Grenada and Ft Charlotte in St Vincent. 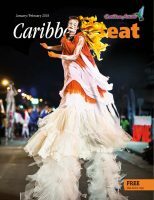 In April, Honychurch was named a laureate of the Anthony N Sabga Caribbean Awards for Excellence in public and civic contributions. The award will go some way to ensuring that his knowledge and his example, of merging his life’s work and service to the country and region, are disseminated throughout the region. His is a valuable perspective, since it manages to remain idealistic about the past, but realistic about the present and the future.